Mint and chocolate chips can combinely modulate flavors of any bland and crimpy edibles, and they can recreate the same magic when infused in a mint chocolate chip lip balm. This lip dab is enriched with goodness of natural ingredients, which soothes and moisturizes the dried cells. The ingredients used in its formulation helps to lock moisture and overcome the cracks, sore and bacterial infection, caused due to weather blues. 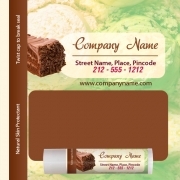 This custom mint chocolate chip flavored lip balm can recreate the magic of festive goodies, which are empowered with these flavorsome ingredients.